The time has come. I knew it would happen sooner or later, but I never imagined it would be this soon. My sweet baby, Donovan, is starting to hit people, mainly me. Now, I don’t think he’s doing it to hurt others. He slaps then smiles, seemingly unaware of the effects of his actions. I think to him, he’s just playing, but to me, hitting is unacceptable. So when Donovan starting hitting, I immediately began reading up on some age-appropriate strategies. I found one in a Parents magazine article that I wanted to test. 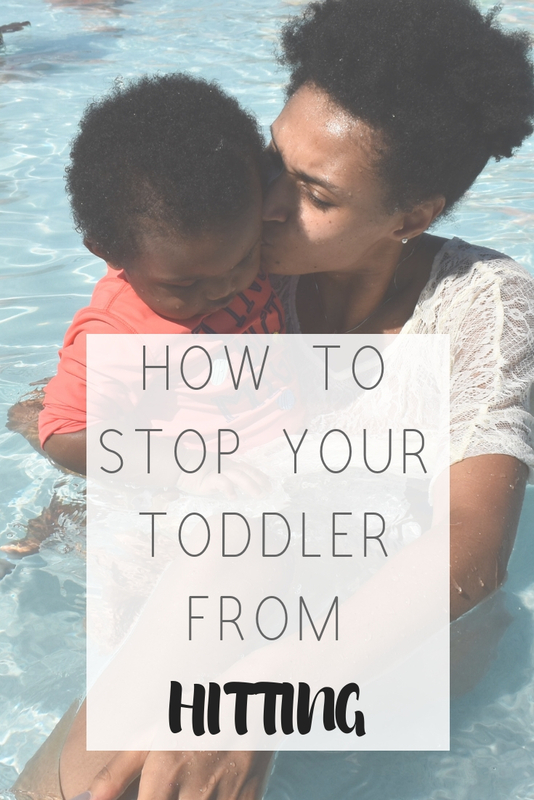 Ari Brown, MD, author of Toddler 411, shared a three-step process rooted in the idea of introducing consequences to actions. Then, I followed up with action when Donovan ignored the threat. I turned away from him for 60 seconds. Then, I told him again, “we don’t hit mommy,” and I gave him a hug. I tried this again and again, and Donovan just found other things to do to entertain himself in that minute. He’s very independent, so withholding my attention just isn’t a consequence he cares much about. I tried putting him in his crib as a consequence, but that only bothers him a solid 20 seconds before he finds other ways to entertain himself in his crib. I was seriously running out of ideas when Donovan hit me yet again, this time, with his daddy sitting next to us. “No, we don’t hit mommy,” my husband said calmly. Donovan scrunched his face up and cried his eyes out in a way that he hadn’t before. He seemed hurt not just frustrated or impatient. I intentionally didn’t scoop him up immediately. I wanted to show him a united front. So I repeated my husband and said, “we don’t hit mommy.” Then, I gave my son a hug and told him we love him but that he couldn’t hit me. I felt bad to see his feelings hurt but also relieved to finally have an alternative to spankings. Dad voice is real, and it works. I also refuse to rely on that alone. Donovan needs to listen to both his parents, and I can’t get down with using my husband as the sole threatening force. That’s problematic in more ways than one. So after talking to my mom in education administration, I changed my approach. Instead of focusing on the hitting, I focus on teaching Donovan the concept of being gentle. Then, I graze his face, and he mimics that action. I call it progress, but the hitting hasn’t stopped. “Expect to repeat yourself 20 times or more — especially if you’ve been inconsistent in the past,” Dr. Brown told Parents magazine. I’ll repeat myself as many times as I need to, and I’ll try my best to be patient. I’m sure I’m in for a long haul, but I won’t be giving up anytime soon. I’m Donovan’s mother, and it’s my job to teach him right from wrong. I don’t take that lightly. Thank you for sharing this! I am also going through the same thing with my 18 month old son. He has been hitting, scratching himself and me. I have tried putting him in his crib as a "time-out" but it only backfired he would hit himself even more from being upset. So now I am trying to show him other ways to express his emotions and also to be more gentle. We’ll see how it goes. I remember this stage with my son, my daughter didn’t experience this. I acted like I was really hurt and crying. I think he cried because he saw me crying. But it got his attention and then I would tell him "don’t hurt mommy". Ooo I’m going to try this! Cute little guy! I’m all for alternatives to spanking and raising voices. So happy you are re-dire ting his behavior with a gentle touch. Kudos to you! I was pretty fortunate that my girl never really had this stage. Toddlers just try out diff ways to express. I am glad you found a non aggressive solution. First of all he’s a cutie and this too shall pass. You are doing the right thing by researching, sharing, and communicating with him your expectations. He may be little but he’ll get it! He is so cute with his chunky cheeks. I’m sorry to hear that he is hitting, but you are countering his behavior with the proper instruction and positive reinforcement. I don’t have kids. I am glad you found a solution. You’re doing a great job! He is a cutie. He’s so cute! I find that a daddy’s voice definitely does the trick, lol. I don’t have kids yet, but this makes me think of when my sister had to deal with it with my nephew, and I also have to sometimes tell him and my niece what not to do (as far as be nice to each other, be gentle, etc). He’s so young, he will probably grow out of it soon but good for you for having the patience to try multiple things. Your son is absolutely adorable. This phase too shall pass and he’ll grow it out especially with you guiding his behavior. I think you are doing some great forms of discipline to get him to stop. It’s definitely going to take awhile to get him to understand but you will get there. Your son is so adorable, and love how you broke down each step of trying to get him to stop hitting. Hopefully, I remember this when I start having children.